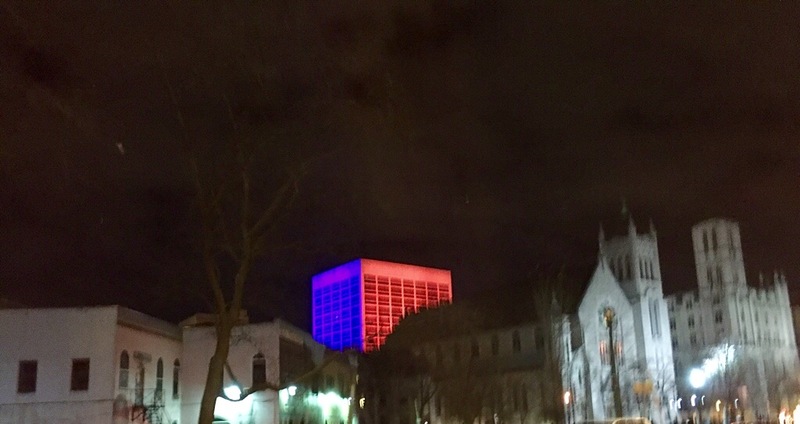 Blue and red in downtown Syracuse. 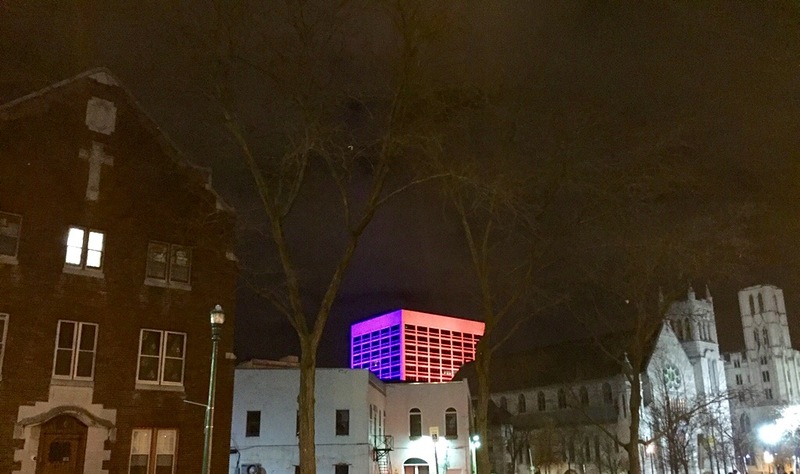 The night before, the tower in downtown Syracuse was lighted up all blue, the choice this month to signal the fight against diabetes. Saturday night crowds walking out of two adjacent buildings looked up at a different tribute. Some 6,000 people from the Syracuse Crunch hockey game and another 2,000 from the concert hall were greeted by the blue and red. To remember Paris. To let them know, in some small manner. We are them, and they are us. How could people do this to other people? Again? Still? More terrorism. In the name of what? God? Change? Retribution? Might? Warning? At the nub, it’s beyond my comprehension. It’s not beyond our compassion. That is a nice expression: It is beyond our comprehension but not beyond our compassion. Thank you, Cynthia. We are together in this healing and hoping for a different and better world. I know, just the worst. Thanks, PJ, as we stick together to heal and hope. More loss of innocent lives it Is so upsetting! We in Florida feel the same as NY it can not help but bring sadness to the World! You have that right Mark!!! nice photo, great sentiments. Unfortunately the attacks on Paris, on top of the downed Russian airliner, and other ISIS atrocities…they have brought down the wrath of the rest of the world…bringing in the big guns to risk total destruction. Who knows what they want? And even a better question is–whatever their reasoning why don’t more of US kinds of people know more about it? What IS the root cause? Now France is retaliating, which is a dangerous game, too. I am equally scared tonight, Gradmama. I like your new theme…the site looks great. Thank you so much, Gradmama. Because it makes them feel powerful and important, Willow. Must be that or something like that. yes Mark I suppose so! I agree, Mark. Beyond comprehension. And easy to feel powerless. But I do believe if we are gentler with ourselves and with others today and the days to come, it will start to change the world. If only we can keep it up–and let those best equipped to handle the craziness be guided by a wisdom far greater than mine. We need wisdom at the top and gentleness at the bottom, Kay. And vice versa. Help us all. Thank you for your dollop of both, my friend. Beyond our comprehension. I can’t grasp it MBM. I never will. Which shows our humanity, our ability to empathize. There’s no grasping this. I just can’t stand having this happen again, MBC. Oh, my. Me either MBM, me either. The news hit me line an anvil, Beth. Love your quote! “It’s beyond my comprehension. It’s not beyond our compassion.” Well said my friend! Prayers for Peace. I can not understand this hatred and the sadness it brings! Kneeling beside you, my dear friend Nancy. Our world is reeling. I agree about both the comprehension and the compassion, Mark. That news was so awful, sis Angie. indeed. It gets worse every day bro Mark. No matter how hard I try, it still leaks in to my apartment. Not worried for myself, but my grandkids. Do they have a future? I believe your grandkids will have a straightened out world by the time they are older, sis Angie. People have to pull together and will somehow. It must have looked lovely. It seems, though, that ugliness turns into more ugliness with people wanting all immigrants to be banned from the USA. I, myself don’t know what to think anymore, only that innocent people should not be killed or suffer, on both sides. Yes, innocent people are NOT to blame, Dora. I so agree.